Jeff has a lifetime of experience in our industry, including plumbing, electrical, and was in the insulation, siding, and solar heating business. Jeff has sold over 350 log and timber homes in his last 14 years at Golden Eagle. He has been a high school football and baseball coach and owned a tavern for 24 years prior to joining the Golden Eagle team in 2005. Jeff is a devoted father who is very proud of his kid's accomplishments both in athletics and in life. Jeff and his wife Pam, a licensed self-employed cosmetologist, live in a log home themselves. Their floor plan is very similar to our Riverview 2038AL Model. Jeff is an outdoors enthusiast who loves hunting and fishing, especially with his Chocolate lab, Gus. It's great working with Jeff because you can talk to someone who has been living in a log home for over 17 years and can answer honestly any questions you may have. Before endeavoring to build a log home, I traveled the entire Midwest interviewing and questioning every log home builder I could find. Then I went to home shows in three states and questioned them all again. They all have a product, they all have answers to your different questions, and they all assure you they can build you the home you are looking for. I felt after all the searching that Golden Eagle was the right people for the job. They had all the right answers and a showroom and a process that made it easy. I drew my own plan, on the back of a napkin no less, and the folks at Golden Eagle Log and Timber Homes produced a plan and showed me what, in a few areas, might work better. Without even bruising my ego. And then gave me the names of three builders in the area where I wanted to build, that they were confident could do the job. My home as of this writing is 98% finished and I could not be happier. It is excellent. And no hassles along the way. Even my builder told me he thought they were so easy to work with and the product was always on time and better then he expected. He had built 4 or 5 for Golden Eagle Log and Timber Homes before he got to mine. Long and short, I MADE THE RIGHT DECISION. YOU OUGHT TO USE ALL MY HOMEWORK AND TRAVEL TIME AND MAKE THE RIGHT DECISION ALSO. I did not get a dime for this testimonial. I just know how hard it is to filter through all the crud... and I have done some building myself in Milwaukee. To Jeff Heeg and your team at Golden Eagle Log and Timber Homes and Mike and Robin Coffen and your team from Coffen Construction. Our relationship started in early 2013 at the Log and Cabin show in Milwaukee Wisconsin. There were about a half a dozen log home builders at the show. My wife Donna and I visited all the builder showcases but the only one that stood out was Jeff from Golden Eagle Log and Timber Homes and Mike Coffen from Coffen Construction. Jeff and Mike treated us with such respect, answering our many questions and taking our interest seriously, in building a quality log home. A short time later we spent two days touring the Golden Eagles operation in Wisconsin Rapids and several homes they had built around the Wisconsin Rapids area. We met and spoke with Jay and Tod Parmeter, the owners of Golden Eagle. They showed us that they personally cared about providing us with a quality home along with a stress free and pleasant home building experience. My wife and I did not visit or even consider talking with another log home builder after our short experience with Golden Eagle and Coffen Construction. By mid-summer 2013 we signed our contract with Golden Eagle and Coffen Construction. Construction started in the fall of 2013, continued thru a very brutal winter and was completed by mid-summer 2014. The coordination and cooperation between Golden Eagle and Coffen Construction made for a very rewarding, and satisfying successful experience. Every person we dealt with at Golden Eagle and Coffen Construction was friendly, helpful, responsive and knowledgeable. Our Golden Eagle Log Home is absolutely beautiful. Donna and I are living the dream. Jeff, we compliment you and your staff. The selection and quality of materials and products was excellent and we are extremely happy with the energy efficiency of our full log home. Mike and Robin, your team built a quality home! We have been so impressed with the attention to detail, both inside and outside. It is coming up on two years since our home was completed and your follow up with any concerns we have had, has exceeded our expectations. Jeff and your team at Golden Eagle, we thank you. Mike, Robin and your team at Coffen Construction, we thank you. We wish all of you much success. It was a blessing and a pleasure to work with you. From Donna and Jack B. Thank you for being our builders - we truly are "Living the Dream"
I just wanted to take a moment to say thanks for the consideration and professionalism you, and the entire Golden Eagle team, showed in responding to an issue we had recently regarding the replacement of a French door that opened on the wrong side. I had visions of looking at that door with deep regret for the next 30 years, but you stepped up and fixed the problem immediately. So many companies talk about their commitment to customer satisfaction, but come up short when the time comes to put that commitment to the test. You can be proud of the fact that your company passed the test with flying colors. Kathryn and I want you to know that we are extremely grateful. I would also add that Jeff Heeg handled the situation beautifully and has been a real pleasure to work with through this entire exciting process. Please extend our thanks to him as well. 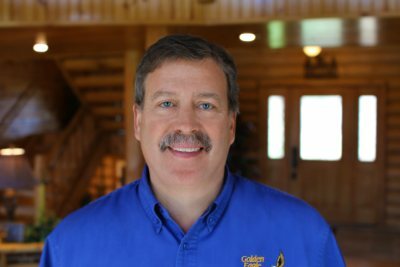 I would not hesitate to recommend Jeff and Golden Eagle Log and Timber Homes to anyone considering building a log home. As the construction gets closer to completion, Kathryn and I continue to grow more excited each day. Thanks for making that happen. Jeff Heeg has been and continues to be very helpful. It was Jeff which gave us our first impression of Golden Eagle Log and Timber Homes. His personality, knowledge and friendliness fit our comfort zone and since then we have worked exclusively with Jeff to give us the best product to meet our needs. I can say that both Ellen and I really enjoyed working with you and Golden Eagle Log and Timber Homes team. You were always very good at answering our questions thoroughly and promptly, getting us in touch with others at Golden Eagle Log and Timber Homes when necessary and generally making the experience enjoyable. I have gone through the house building experience before and I know first hand how difficult it can be at times. Our experience with Golden Eagle Log and Timber Homes and Barker Brothers Construction was outstanding and we could not be happier with the home we have as a result.